Chesterton Choral Society – We are a friendly amateur choir based in Chesterton, Cambridge, UK. Our members come from many areas though we are proud of our local Chesterton roots. 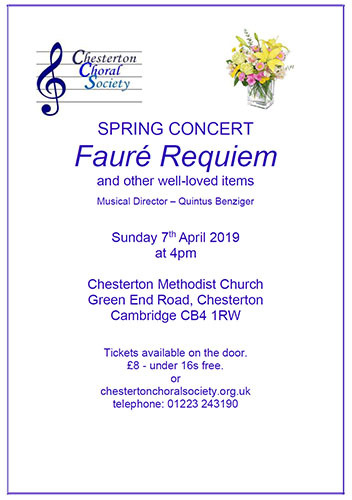 Chesterton choral society is a non-audition amateur mixed choir based in East Chesterton, Cambridge. The choir is relaxed and friendly, preferring to enjoy a wide range of styles of music, from classical and sacred works to well known songs from past decades. About forty to fifty strong, the choir celebrated its 50th anniversary in 2014 and continues to grow in strength. Rehearsals take place on Monday evenings from 7.30-9.30 pm at Chesterton Methodist Church, Green End Road, Chesterton, Cambridge CB4 1RW. The choir rehearses during school term, and works to a three-term programme with a concert at the end of each term. Concerts often take place at 4pm on Sundays.